How to use 802.1X authentication for Wi-Fi? - DrayTek Corp.
How to use 802.1X authentication for Wi-Fi? 1. Go to Wireless LAN >> Security. 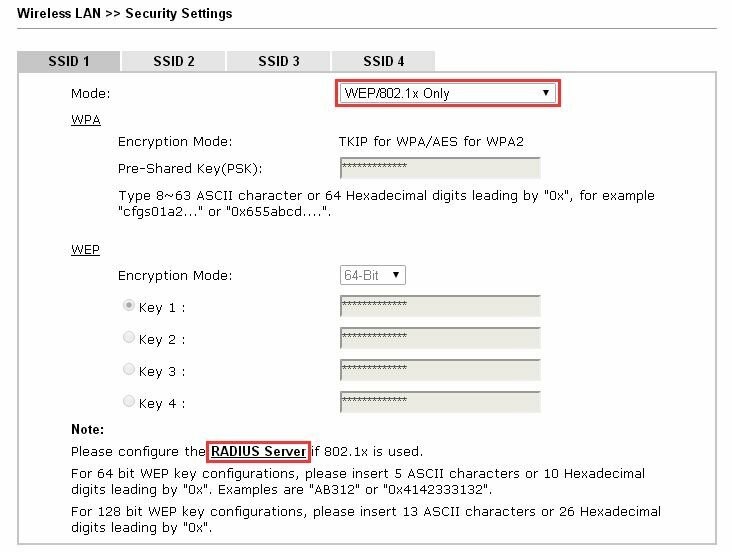 Choose "WEP/802.1X Only" and click on RADIUS Server. 2. Enable RADIUS service and input the RADIUS server IP and shared secret. How to use Vigor Router as a RADIUS server? How to use VigorAP 700 as a RADIUS server? How to use 802.1X authentication for wireless clients with Local 802.1X? 3How to use 802.1X authentication for Wi-Fi? has been viewed------ 3 ------times.